We sell survival paracord bracelets in a variety of colours and with added features such as a compass, whistle and fire starter. All bracelets in this category are made from paracord. Parachute line is a rope made from nylon. It was originally used by parachuting soldiers during World War II. Today, this thin yet sturdy nylon rope has many uses, including everything from tents, clothes, bags and even repairs in space. These days, you can get ropes and bracelets that look and feel like parachute line but are actually made from polyester. Don't be fooled by these imitations. Real paracord is made from robust nylon. Soldiers and outdoorsmen have gradually found many ways to use paracord because of its tremendous strength-to-weight ratio. There are many stories of people in WWII who used their parachute lines in very creative ways. It was from these creations that paracord bracelets came into the world. Suddenly, we got a thin but incredibly strong material at hand, perfect for outdoor usage. That led to the development of survival bracelets with outdoor gadgets such as a compass, whistle, and fire starter. At Trendhim, we have a wide selection of these bracelets. We sell everything from very classy paracord bracelets to the ones that have useful accessories for outdoor activities. All of our survival bracelets are offered in one size, ranging from model to model. You can see the size of each product under the "Dimensions" heading . Generally, these bracelets are slightly larger than others and vary from 8" to 9" in length. 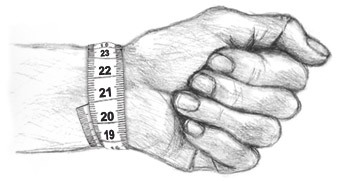 You can find your size by measuring your wrist just above the wrist bone, as shown below. Then you add 0.8" to 1" to what you got and that would be the best size for you. Classic survival bracelets are typically sold with either a standard plastic snap fastener or the more creative metal locks these bracelets are often known for. If you choose the metal lock, you should be aware that it's more of a hassle to put on and take off. On the other hand, these bracelets are very secure and, of course, more damage-resistant than a plastic lock. Today, locks are also made with both whistles and fire starters.